Shopping for Wonder Woman Puppets? 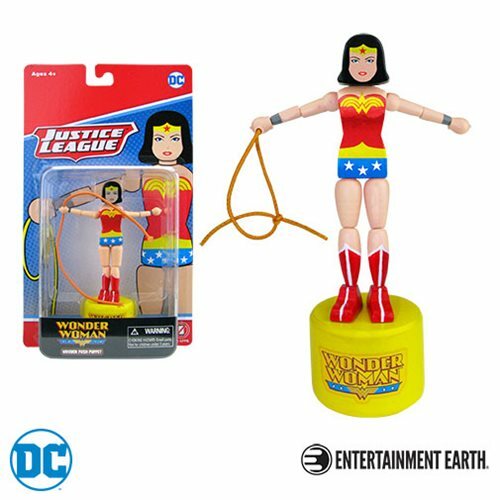 Enjoy WONDER WOMAN™ as a push puppet! Push the hidden button on the bottom to see the AMAZON PRINCESS™ move! Thanks to the clever designers at Entertainment Earth, you can enjoy WONDER WOMAN™ as 5-inch scale floppy wooden puppet that collapses, moves, and stands up again when you push the hidden button on the bottom of the base! Created from solid wood, this WONDER WOMAN™ Wood Push Puppet features vivid hand-painted artwork, along with some decal elements. Cute and fun as can be, the timeless AMAZON PRINCESS™ is designed in a vintage style reminiscent of traditional push puppets known as Wakouwa. Ages 14 and up.